Have you ever wondered why sometimes you eat chips and it feels like they always seem to annoyingly get stuck in those back teeth at the top and bottom of your mouth? Your back teeth are called molars – the first molars erupt early around age 6 years and the second molars erupt a bit later around age 12-14, although this varies among individuals. These molar teeth are designed by nature for chewing your food masses before you can swallow; whereas the front teeth, called the central and lateral incisors (the ones with the straight edges) are designed to cut into food. Because of the function of these molars they are larger and have unique grooves on the biting surface. Sometimes these grooves can be quite thin and deep, reaching all the way from the surface enamel of the tooth into the dentine. These grooves or fissures, as they are technically termed, are commonly a difficult area to keep clean because the bristles of your brush are wider than the fissures. Each time we eat, food is impacted into the deep recesses of these fissures but we are unable to access it to clean well and this makes the tooth susceptible to tooth decay. So how do we overcome this? Apart from addressing dietary issues such as avoiding sugars and sticky or starchy foods, the dentist can protect the fissures that are considered at risk of getting decay by placing sealants in the dental chair. The process takes a few minutes and does not require the use of anaesthetic. We simply clean out the fissures – this may involve minor surface roughening and removal of stains with a high speed handpiece and is followed by application of a solution not dissimilar to soap to condition the tooth. This allows a rougher surface to allow a better bond to the sealant, which is a thin plastic coating that is applied as a liquid into the cleaned fissures and set hard with a blue light. 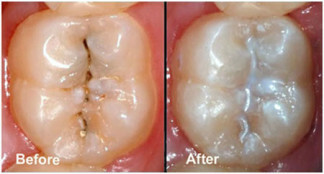 As long as the sealants remain on the tooth then those grooves are completely protected from decay. You can eat and drink straight away but you do still need to clean the other surfaces of your teeth that have not been sealed by brushing two times daily with fluoridated toothpaste. Fissure sealants do occasionally wear and tear over time so make sure you return for your six monthly check-ups and we can patch them up if we see they do fall out.